High school enrollments abysmally low. 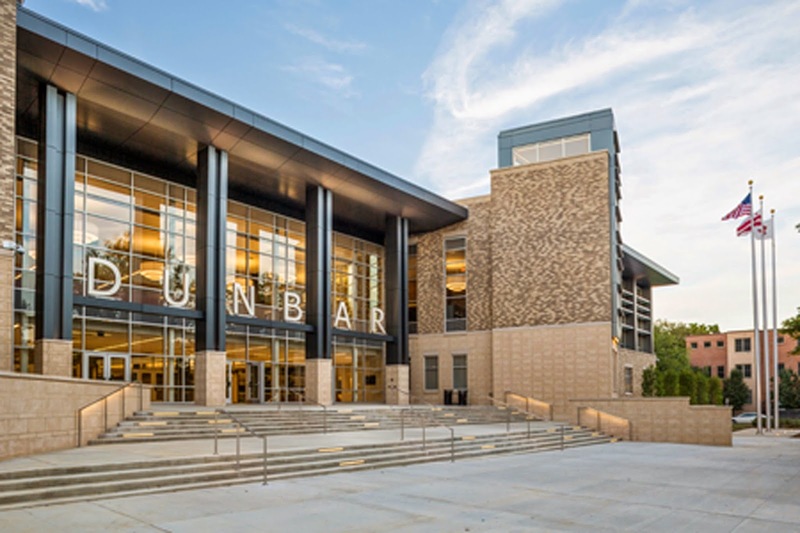 Given that most of DC's high schools have enrollments around 500-600 students, I've argued that rebuilding Dunbar High School was an incredible waste of money. It would have made much more sense to close the school and redistribute the students to other schools, thereby making those schools stronger, instead of maintaining the weaknesses of four schools. It costs money to build a school. Not to mention it cost $122 million to build the school, and with the interest costs, it will cost much more ("DC wastes $122 million on new high school: evidence of failures in capital improvements planning and budgeting"). Capital budgeting is weak. DC doesn't have a independent and transparent capital improvements planning and budgeting process that is separate from the normal annual budget appropriations process, which is a problem. Surprisingly, the DCPS Chancellor has called attention to this recently, as reported by the Post (and pointed out to us by charlie) in "D.C. schools chancellor recommends overhaul of capital planning process." D.C. Schools chancellor Kaya Henderson is calling for an overhaul of the process for mapping out school modernizations in the coming years, saying that the renovations have become overly political and prohibitively expensive. “My very honest assessment is that the whole CIP process is jacked up,” she said, referring to the Capital Improvement Plan, a six-year capital budget and construction plan that outlines the timing for school modernizations. The queue for renovations is included in the mayor’s budget and submitted to the D.C. Council each spring. It gets rearranged annually, with some projects moving up or back or growing in scale and price tag. It also typically gets adjusted again halfway through the year. It's significant that Chancellor Henderson raised the issue, more because of staff time than money, because ultimately the DCPS budget doesn't really pay for capital improvements. DC will have to increase its debt cap. Not to mention that the unneeded construction project absorbed a not insignificant proportion of the city's bonding capacity, which is coming close to being fully committed ("D.C. Council report suggests District may need to raise its debt cap," Washington Business Journal). Gilbane Building Company announces Dunbar Senior High School was awarded U.S. Green Building Council's LEED® for Schools v2009 Platinum certification – making the high school project the highest rated and only Platinum LEED BD+C: Schools v3 - LEED 2009 project worldwide to receive 91 out of 110 points. The project incorporated many sustainable features including DC's largest "geothermal" system, a 482 kW photovoltaic array provided through the District's first Power Purchase Agreement (PPA), two 20,000-gallon cisterns, energy efficient low-E glass and low-VOC materials, sustainably harvested wood products, increased acoustical performance for the learning environments, recycled materials, use of regional materials, storm-water quantity and quality controls, utilization of innovative wastewater technologies, and 95 percent construction waste diversion. But shouldn't negative points have been assessed against the project because it wasn't needed? 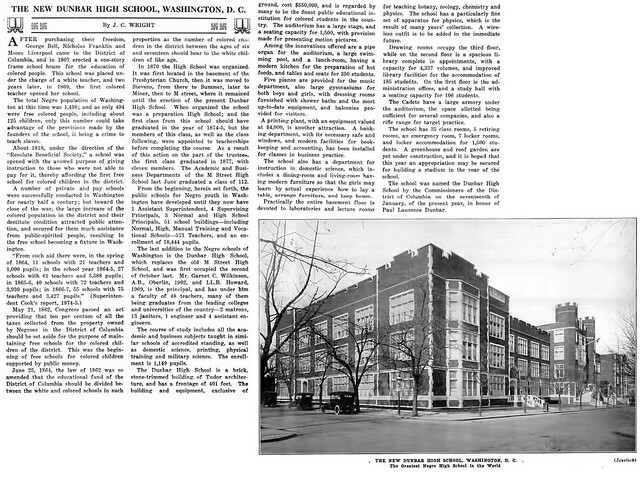 1918 article from The Crisis about the construction of the original Dunbar High School. Dunbar as a historical example of waste and anti-sustainability in capital planning. The current Dunbar High School is the third building so named. The first opened in 1918 and was of the collegiate gothic style that typifies other DC high schools still in operation, such as Eastern High School. That Dunbar was torn down and replaced with a brutalist prison-like building. 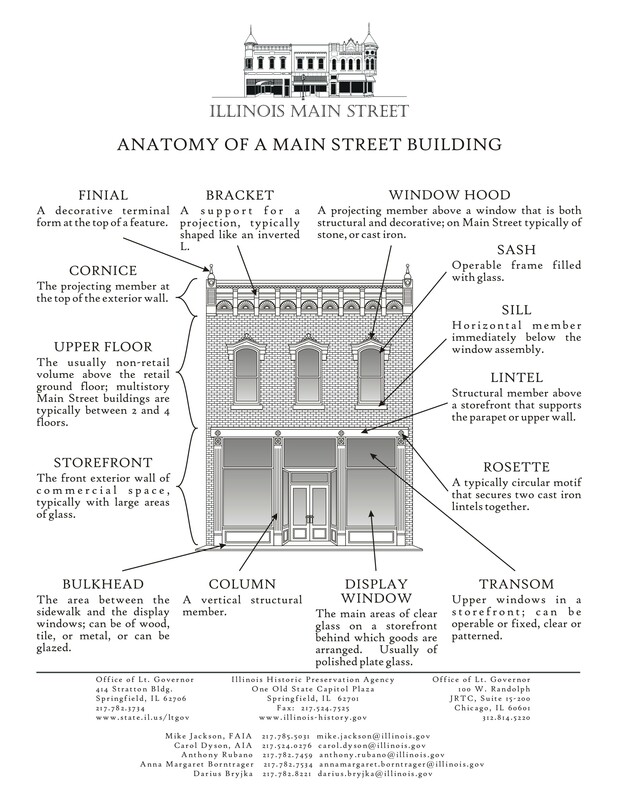 The original building is what we would now call a historic building that had unlimited useful life ahead of it--it didn't need to be replaced. But locally, the unnecessary replacement was seen not as waste, but as progress. I imagine too it was a result of the city moving to Home Rule and wanting to construct a new high school as a symbol for a newly emancipated city. It is the brutalist building from 1977 that has been recently replaced. While the "old" building was probably "beyond repair" between its bad design and likely poor maintenance, it didn't need to be replaced, but demolished. The real lesson: a new school building doesn't make old problems go away. Interestingly, Ghosts of DC dug up an article from the Post about the opening of the 1977 version, an ugly building sure. Until 1954, when the Supreme Court struck down school segregation, Dunbar was a strictly academic school, drawing the brightest black youngsters from throughout the city and sending about 80 per cent of them on to college. 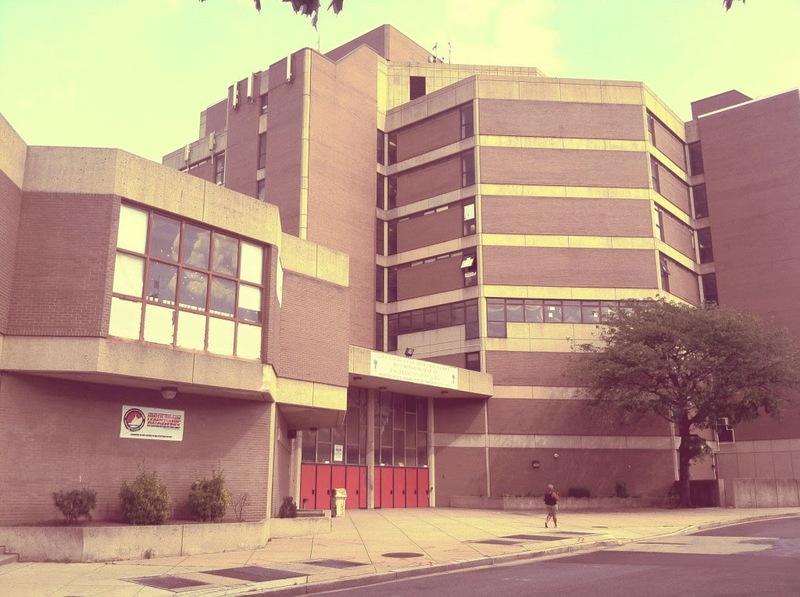 Dunbar since has become a neighborhood high school, drawing its students from some of the poorest neighborhoods in the city. It has the same difficult problems of discipline, absenteeism and low academic achievement that beset schools in big city slums throughout the country. In an attempt to improve the newest school's scholastic outcomes, there are proposals to take Dunbar back to its roots as "a selective school." But this is not without controversy either ("Dunbar High School autonomy proposal stirs debate in D.C.," Post). Conclusion: there is nothing sustainable about building a facility that isn't needed. Dunbar is a metaphor for lack of controls and spurious construction in DC's capital budgeting process. I can't think of many projects that are better examples of an anti-sustainability development paradigm. I always wonder how much the mania for schools buildings -- not a problem unique to DC - is about competing for teacher, not for students. Also see the Wilson school in Rosslyn. Given that most of DC's high schools have enrollments around 500-600 students, I've argued that rebuilding Dunbar High School was an incredible waste of money. It would have made much more sense to close the school and redistribute the students to other schools, thereby making those schools stronger, instead of maintaining the weaknesses of four schools. Dunbar is a very important high school historically. We here in DC do not value our history very well (see Stevens). This is part of the problem. Respect and value for history. in the normal course of events, I'd agree with you. I think the case can be made that Dunbar #2's construction simultaneously discarded the history that had been embodied in Dunbar #1, as it was not carried over. The question of what is legitimate continuity is a good one. Does keeping the name but not the building maintain a deep enough link and connection? And it's probably variable. Sometimes yes, sometimes no, depending on the situation. I can't claim to be so intimately familiar with the functioning of this school to say definitively. I do think it was tragic to demolish the original building, given the history of the school and the building, and its then intimate link with that history. it's likely the history of Dunbar #2 as relatively unsuccessful has been successfully carried over to Dunbar #3, despite the new building, which in and of itself isn't enough to arrest and/or disrupt the current trajectory. note that in a column a couple weeks ago, Post columnist Colbert King mentioned a conversation he had with former Senator Edward Brooke -- both went to Dunbar High School. They remonstrated about the demolition of the original high school. The column says that choice was celebrated by black nationalists, who say the original Dunbar High School and its history as a representation of "black elistism".